Conditioning is the key to all of our training, weather it be Pai Lum Kung Fu or Commando krav Maga. The body and the mind are linked, and one cannot be healthy without the other. If the body is in bad shape and not taken care of, then the mind cannot be focused or disciplined. Macabee Martial Arts trains the body aerobically and anaerobically. It trains the muscles to move quickly in order to respond to threats. Along with physical conditioning, Sports Yoga and Chinese stretches are taught to keep the body limber and injury free. Kung Fu is a Chinese term used to denote a person who has acquired a great amount of skill through training over a long period of time. Macabee Martial Arts aims to train a persons mind, body and spirit to be in harmony with each other as well as his or her environment. This is a no-nonsense ultimate reality self defense program combining the effective Israeli hand-to-hand combat system of Commando Krav Maga and Shaolin Kung Fu, to confront the most brutal and vicious street and domestic violent situations. During the training, attack scenarios are simulated to be as realistic as possible. This is to maximize your survival skills so you can perform them under duress. The key is muscle memory. The program is broken down into 7 certification levels. You may train through each level as an SAC student or take the SAC instructors course. Level 1 will teach you how to survive chokes, gun, knife, assaults with hands, rear chokes, and ground survival. Each level is 36 hours of instruction. 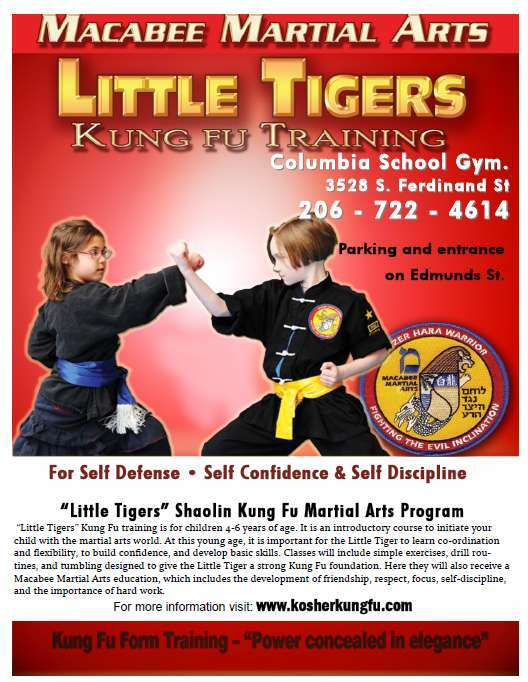 The "Little Tiger" Kung Fu class is for children 4-6 years of age. It is an introductory course to initiate and to familiarize your child into the martial arts world. At this age, it is important for the Little Tiger to learn co-ordination and flexibility, to build confidence, and develop skills. 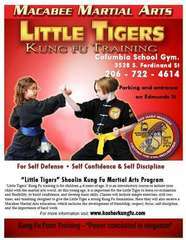 Classes will include basic exercises, drill routines, and tumbling that is designed to give the Little Tiger a strong Kung Fu foundation. Here they will also receive a Macabee Martial Arts education, which includes the development of friendship, respect, focus, self-discipline, and the importance of hard work. Kung Fu is for everyone! There is no age limitation. Pai Lum (White Dragon) Kung Fu is ideal for any individual to keep in shape both physically as well as mentally. All students will learn basic traditional fist and weapon sets from the Pai Lum and Tiger Crane systems that will help to improve overall physical condition. Within weeks, you will feel a definite improvement in their well being. An obvious benefit of martial arts training is the ability to defend oneself from physical aggression. Improvement in speed, strength, skill and reflex will be evident after several months of intensive training in White Dragon Kung Fu.